Cornerstone brings learning to life! We are now a Certified Schoolyard Habitat Site! We are now enjoying our brand new outdoor classroom. Watch the slideshow! On May 10, 2016, Cornerstone Academy dedicated it’s recently implemented Outdoor Classroom, a National Wildlife Federation Certified Wildlife Habitat and unique learning space. The school’s students, faculty, and families gathered for a ribbon cutting, outdoor meditation and planting ceremony. Cornerstone Academy has been recognized by the National Wildlife Federation (NWF), America’s largest wildlife conservation and education organization, as a Certified Wildlife Habitat® through its Garden for Wildlife program. NWF celebrates the efforts of Cornerstone Academy to create a garden space that improves habitat for birds, butterflies, frogs and other wildlife by providing essential elements needed by all wildlife – natural food sources, clean water, cover and places to raise young. Certification also makes the Cornerstone part of the Million Pollinator Garden Challenge, a national effort to restore critical habitat for pollinators. 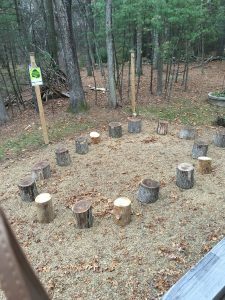 Money for the Outdoor Learning Space was raised by Cornerstone’s Parent Teacher Group through fundraising that began in 2014. Currently, the three-acre property, includes a canopy, natural seating area, birdfeeders, windchimes, a greenhouse, birdbath, and arbor. We look forward to installing several additional elements including a raised garden bed in which the children will be planting strawberries and herbs, an animal tracking station, a weather station, night vision camera, and a viewfinder. With nearly 200,000 locations and growing, NWF’s Certified Wildlife Habitats and Community Wildlife Habitats recognize individuals, schools, groups and whole communities committed to providing habitat for wildlife, including pollinators. NWF’s Garden for Wildlife program encourages responsible gardening that helps pollinators and other wildlife thrive by planting native species like milkweed and discouraging chemical pesticide use. This makes yards, schools, businesses, places of worship, campuses, parks, farms and other community-based landscapes into wildlife sanctuaries.